One of our upgrade options at Hudson Woods that best captures the imagination of both kids and those who are kids at heart, is the treehouse. Designed with a touch of nostalgic sensibility, the tree house creates an active zone that empowers kids to explore the outdoors and spend time in nature. 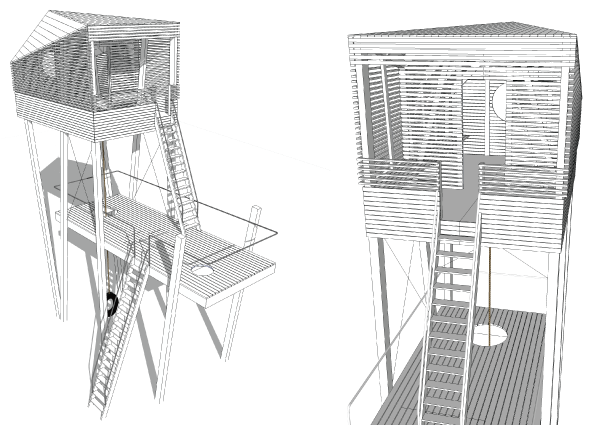 Drawing from traditional vernacular, this is a carefully conceived, modern and well crafted take on the conventional tree house with fun and safety at top of mind. The tree house is divided into three volumes, each section inspiring different activities. The ground level features a tire swing while the lower level is a 215 square foot open platform with a climbing rope and steel and mesh railings. The upper level features a 165 square foot enclosed upper platform with eco-friendly Richlite cladding on the exterior. As an Architectural rainscreen/cladding, Richlite keeps structures more dry, preventing corrosion and warping over long periods of time. The military used it to make crates to hide supplies under water. It is also Greenguard certified for children & schools which means it has no VOC’s (volatile organic compounds) or off gassing and is 100% recycled content. The Richlite factory utilizes a “Waste to Energy” system in which they use the waste to fuel the plant, lowering emissions by 80 percent. An important driving factor of the elements we design for Hudson Woods is connecting families and friends by creating rich, unique and memorable experiences. This means attentive design from curating spaces to selecting durable eco-friendly materials.